A video honouring the 85-year-old play-by-play icon was shown on the video screen during the first period of the Battle of Ontario between Toronto and the Ottawa Senators. 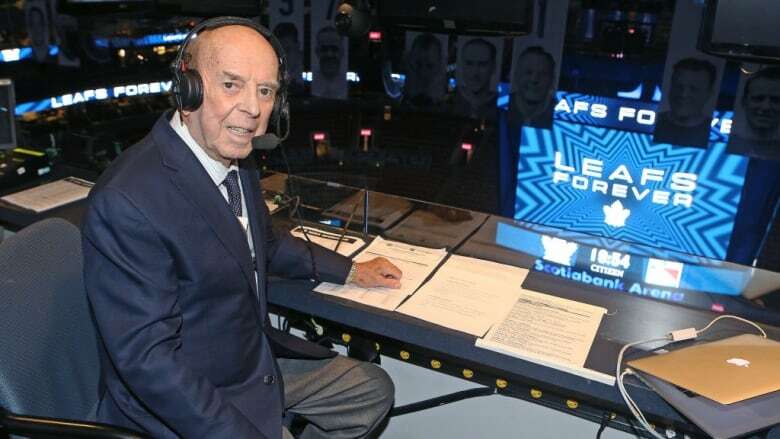 The Maple Leafs paid tribute to legendary broadcaster Bob Cole on Wednesday night. "His iconic voice has provided hockey with some of its most memorable moments," said the voice-over. It drew a standing ovation to the strains of Frank Sinatra's "My Way," with Cole standing in the booth to acknowledge the tribute. Toronto coach Mike Babcock, knowing there was history in the building with Cole calling the game, mentioned Cole in his morning meeting with media. "It might be his last time in this building," Babcock said prior to the game. "So good for us (and) anybody old enough to know who Bob is." It's Cole's 50th and last season on "Hockey Night in Canada." He is slated to call 10 games, with Sportsnet saying Wednesday was indeed his last Scotiabank Centre assignment. It was decades in the making. In 1956, on the way back from a trip to New York, the aspiring broadcaster decided to drop off an audition tape at Foster Hewitt's Toronto radio station. To Cole's surprise, Hewitt made time for him and listened to the tape right there. Hewitt's advice, to save the big call for the big play, to use different voice levels and to feel the flow of the game, served Cole well throughout his career. "Oh Baby" remains his trademark call. In his 2016 autobiography "Now I'm Catching On. My Life On and Off the Air," he first remembers using it to describe some memorable Mario Lemieux stickhandling in a 1991 playoff game against Minnesota. "What a goal! What a move! Lemieux! Oh baby!" Cole said excitedly after Lemieux skated through the defence and deked the goalie. "I don't know when it's going to come out. No idea . . . . I don't plan it. It's spontaneous," he wrote. "I don't script the thing. It's ad-libbed . . . and that's what broadcasting's all about." Cole has done more than hockey. He called Bob Beamon's world-record long jump at the 1968 Olympics, curled in the Brier, served as quiz master on "Reach for the Top" and worked for the Newfoundland government. The native of St. John's, N.L., counts family, flying, dogs, Broadway shows and fly-fishing among his loves. Cole was honoured by the Hockey Hall of Fame in 1996 when he won the Foster Hewitt Memorial Award for outstanding contributions as a hockey broadcaster.